In his first film as writer-director-star since 2002’s “Assassination Tango,” Robert Duvall delivers a complex, ambitious genre piece that combines family drama and murder mystery, set in the south Texas ranch country. While the mix doesn’t always cohere, the film boasts moments and scenes that rank with Duvall’s best work. The tale begins with a scene so darkly lit and rapidly staged that it’s hard to tell exactly what’s happening. But the gist soon becomes clear: Rancher Scott Briggs (Duvall) catches his youngest son engaged in sexual activity with another young man and throws both of them out into the dark, banishing his boy from his life with curses and furious urgings that he read the Bible. Fifteen years later, Briggs is the same cussed sonuvabitch but things are happening on two fronts that signal change in his settled life. For one thing, a Texas Ranger named Samantha Payne (Luciana Duvall, the filmmaker’s real-life wife) is moving to reopen the case of the boy that Briggs caught with his son, who disappeared that same night. For another, the septuagenarian has decided it’s time to plan his estate, and that involves calling home the black sheep son he so unceremoniously ran off a decade and a half before. 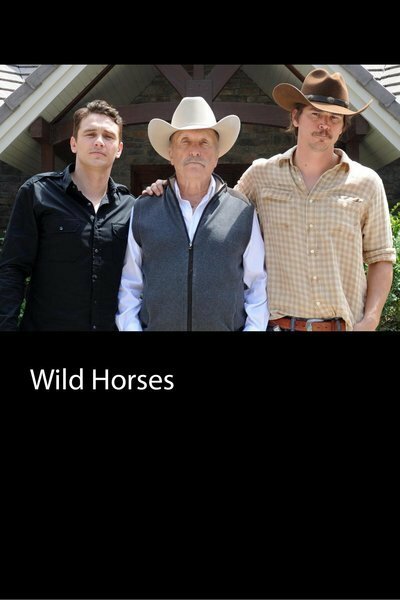 Ben Briggs (James Franco) returns to the ranch looking as uncomfortable to see his father as the old man is to greet him. Years of suspicion, anger and hostility on both sides mean these two will have no easy time becoming reacquainted, much less reconciled. Ben gets a less frosty welcome from others on the ranch. Older brother KC (Josh Hartnett) has adopted his dad’s profession and lifestyle and pleased the old man by having a family of his own; he seems to have no trouble with his Ben’s sexuality that a little playful teasing won’t resolve. And Ben shows real pleasure at reencountering Maria (Angie Cepeda), a Mexican house worker who’s grown up with the family. Duvall does a good job evoking the spaces, rituals and characters of Briggs’ rough-hewn part of the country, and in suggesting how these have formed the paterfamilias’ split character. On the one hand, Scott is a staunch traditionalist who follows the Bible and no doubt considers himself a law-and-order conservative. On the other hand, he’s got enough of the Wild West in him to take the law into his own hands when it suits him. The latter tendency leads him to fire on illegal immigrants trying to enter the U.S. on his land. It also prompts him to do something rash when he learns that the female Texas Ranger is reopening a case that he would prefer see forgotten: He contacts a corrupt cop he knows (Jim Parrack) and asks that he makes sure Payne is stopped. Once the film’s story gets rolling, it’s clear we’re in for a bumpy ride in some ways that were intended and others that were not. Most significantly, the tale’s two main plot strands—the murder investigation and the tortuous family reunion—unfurl rather awkwardly at times and intersect with each other unconvincingly. There are plot holes that call attention to themselves, as well as some missed dramatic opportunities—especially concerning the characters played by Hartnett and Cepeda—that contribute to the story’s impression of hasty, unfinished contrivance. At the same time, Duvall is such a master actor that the vehicle he’s created for himself works fascinatingly as such. Scott Briggs is a multi-dimensional character who’s in the process of changing as he contemplates his death. Can he come to terms with his demons, or will he add news sins to the old ones as he tries? In almost every scene where his character appears, Duvall adds nuances and details that make the man both dynamic and unsettling, which results in a number of dramatic passages that are surprisingly powerful. He does a good job with the other actors too, but the stand-out here is Franco, who adds another item to his Queer Studies portfolio but does so in a way that avoids cliché and obviousness in favor of wit, strength and subtlety. The relationship between rancher dad and gay son is not only at the emotional heart of “Wild Horses,” it’s also the key to the film’s thoughtful, humane thematic gist, and the work of two fine actors helps make that difficult conjunction a believable and memorable one.